If you are thinking about starting a garden this year, you should consider starting a compost pile. Composting is recycling in its simplest form. In a bin or a pile you throw together all kinds of organic matter. Stuff you would normally throw away like vegetable scraps and leaves. Then all the little micro-organisms work together in the pile to break down the organic matter into a rich fertilizer you can use in the garden. Worms also like to set up shop in the pile to help break down materials. So stuff you would normally just throw in the garbage can help make your garden grow! And it’s helps the environment by reducing the amount of trash in landfills. I started a compost the first year I started gardening. I’ve been at it for about 2 years now. And I still compost everything I can. Composting has helped reduced the amount of trash we set out each week. 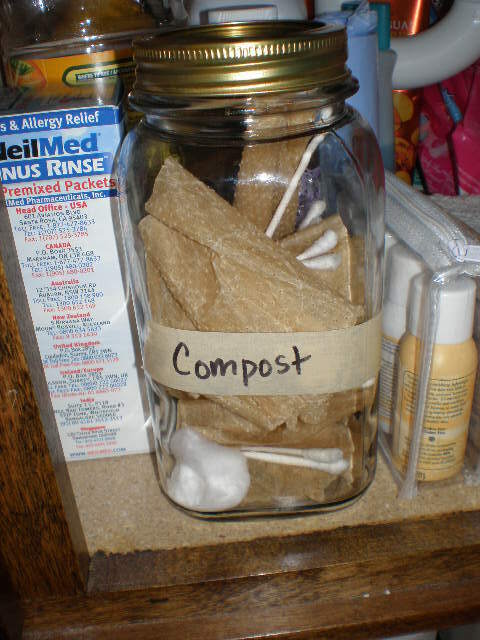 I thought today I would share how I go about composting in my everyday life. Once you get into the habit, it’s not hard at all! It takes up very little of my time. Instead of throwing things in the trash, I just put them in a separate container. In my kitchen under my sink I keep a couple of large plastic containers. These are plastic containers with lids from the salad bar at the grocery store. I rinsed them out and reused them as compost containers. They live under the sink most of the time. 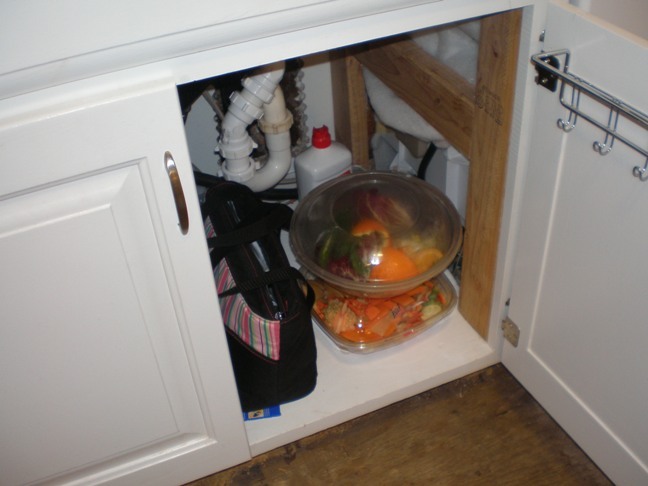 You can use any type of container to hold your compost scraps, as long as it has a LID. 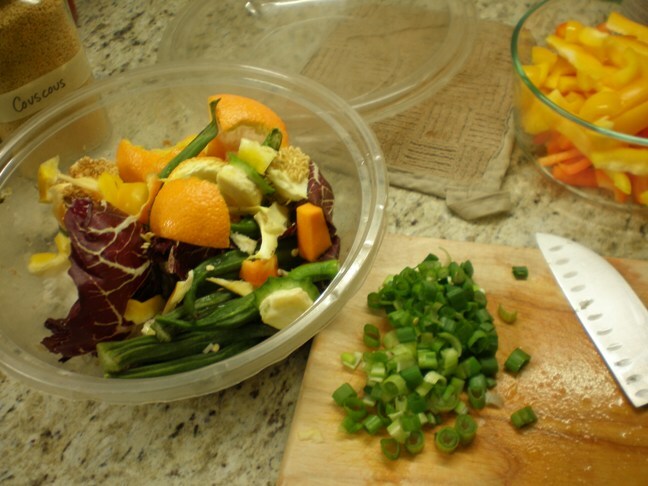 A lid is important because the compost scraps start to break down right away and can get quite smelly. When it’s time to cook, I get one of the containers from under the sink and set it on the counter. As I’m chopping whatever I’m using, the scraps go into the plastic container. The good stuff goes in another bowl. When I’m done I pop the lid back on and put it back under the sink. 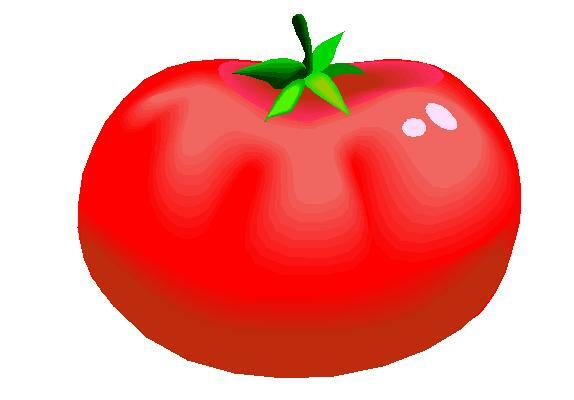 I just can’t bear to throw that stuff away when it can be so beneficial to my garden! Throwing it away seems like such a waste. 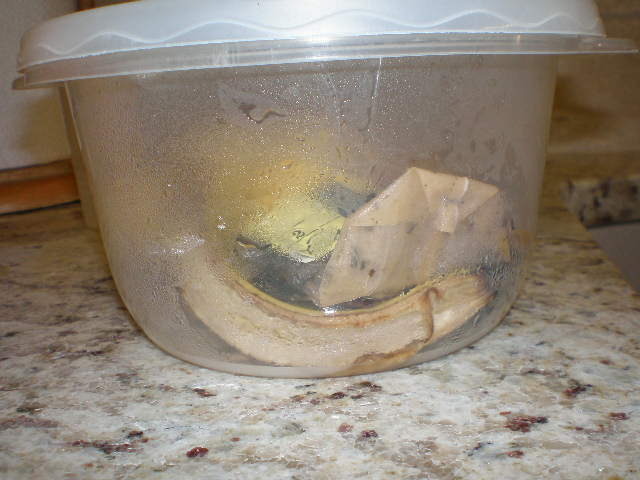 When I get home and empty out my lunch bag, I dump the peels into the containers we keep under the kitchen sink. The main thing that goes in here are dryer sheets. I use Seventh Generation Fabric Softener Sheets, which are awesome because they are recyclable and compostable. I also like that they have a perforation down the middle so you can tear them in half and only use a half sheet per load. They last a long time that way. I usually fold clothes in the bedroom and I always ended up with dryer sheets laying around everywhere because I never took them into the kitchen to deposit them into the main household compost bin (see above). So I re-purposed this jar to serve as a compost collector in the bathroom right off our bedroom. I recently started sticking cotton balls and cotton swabs in here too. I’m not sure if they are actually compostable, but I figure they are made out of cotton and cardboard so why not? When this jar is full I take it to the kitchen and empty it into the containers we keep under the sink. When the containers under the sink are full, I walk them out to the garden and dump them in the big compost bin. I try to dig a hole in the compost first, dump the scraps in the middle and then cover it back up. Sometimes I just dump them on top and then stir the whole thing with a pitchfork. Oh who am I kidding. Benzo is the one that does the stirring most of the time. And sometimes if we’re both feeling lazy (or it’s really cold outside) we’ll just dump it on top and run back in the house. In the winter I only have to empty the containers about once a week. In the spring and summer and fall when the garden is super productive and I’m eating tons of fresh produce, the containers get emptied every 2 or 3 days. But I’m out in the garden all the time, so I just take the bins out there with me when I go to check on the plants or pull weeds. Composting is so easy. It does not require a lot of time or energy. The stuff you put in the compost will break down eventually no matter what. It will break down faster if you maintain the pile by stirring it every so often, but even if you don’t do anything it will still break down. On the Gardening tab there are several links to Compost resources for help on starting a compost. If you have a compost already, please share your tips in the comments below!